"A house without pets is not a home"
Les and I have been married for over 30 years and have a grown up family who now live in different parts of the world. We have both been retired now for five years and very much enjoy the freedom and chances to do different things that this new status affords us. I worked in secondary education, teaching science and senior biology. However, probably most of my teaching time was as a Deputy Principal in a Christchurch secondary school. I enjoyed the challenges and rewards of this career. Les has had a number of careers -- starting as a Maths and Physics teacher before spending time in the New Zealand Air force as an Education Officer. Once retiring for rank (Squadron Leader) at 45 he worked as an IT consultant for the University of Canterbury. We have four cats - each with quite a different personality. We also have a large fish pond with about 50 gold fish. We both enjoy travelling and spending time with friends and family, It is wonderful once retired we found we had time to do both these things! I enjoy gardening and have nearly an acre of garden to look after and so I suppose it is just as well that I do enjoy it! I also like to swim and to meet up with friends. Les is very much into movies and music and collecting stamps. We enjoy going to the theatre to watch live performances. We like to travel and meet new people. We enjoy being based in a place and having an opportunity to really feel part of the community. However, the main attraction for us would be to have pets to look after since when we have travelled in the last few years we have really missed being away from our 'furry gang'. We have used the House Sitter site to procure House sitters for our pets and it has seemed, on talking with these people, a wonderful way of being able to combine several things. We are new to the House Sitter site for offering our services but we would love to be able to travel and spend some time in one place looking after animals. 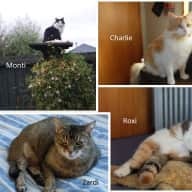 We have used the House Sitter site ourselves for looking after our pets for the last two years when we have travelled to visit our family in the United Kingdom . We have a love and are experienced with looking after cats and dogs predominantly but are comfortable with other animals such as rabbits and fish as well. My husband originally came off a farm and so has experience with many animals including dogs, sheep and lambs and chickens. I have owned a dog which I adored and still miss. She was a great companion who even slept on my bed!! It was wonderful to have her company and also someone to inspire me to get out and walk! We currently have four cats - three of which were strays that found their way to our home. and have decided that it is cat paradise and so no need to move on and find another place to live. We love all of them and enjoy their company, their different personalises and antics enormously. it is hard to leave them and go away but they are happy in their home and are always receptive to other people who like animals looking after them. My partner, Andy, and I looked after Chris and Les's cats and home while they were away for two months in 2016. It was an absolutely perfect experience! Chris and Les are very friendly and welcoming. We immediately felt at home when we arrived. 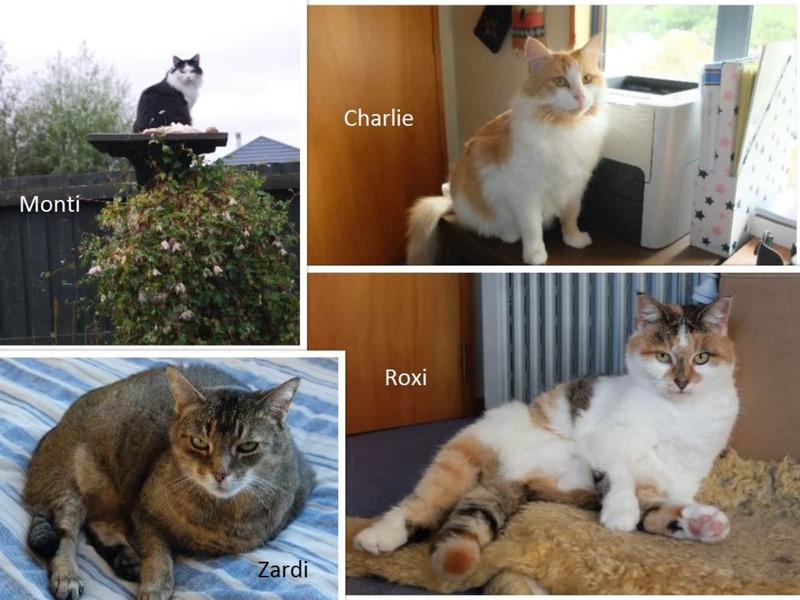 Charlie, Monty, Zardi, and Roxi are great and we loved having them to keep us company in this big house. They are very independent but warmed up to us quickly. The house and garden are absolutely lovely and there are plenty of great places to visit nearby (Christchurch, Mt Hutt, Akaroa). We spent an entire year living in New Zealand and this was one of our best experiences!! We were so lucky to have landed this house sit. I highly recommend Chris and Les to anyone who is looking for some furry friends and a lovely home to look after.